Quality tire, looks great, beast price online and arives quickly. 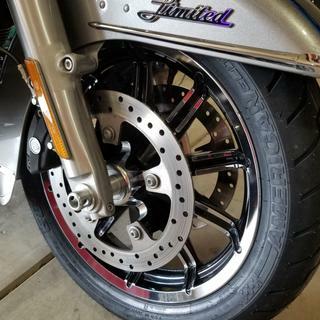 I run American elite tires on my 2009 FLHTCU and I like them way better than the chicken foot pattern OEM tires that comes stock on the HD. I get better mileage and less tire noise when the tire gets older, because of less scalloping wear on the American elite tires. The American Elite is the best tire I have ever ran hands down. I have used just about every tire on the market and this tire is the best in everything. Great looking tires, looking forward to putting some miles on them! Best touring tires I’ve found hands down. If you own a touring bike don’t waste your money on any other tire. Great tire smooth ride great traction best tire I have ever bought. I put the Dunlop American elite front tire on My '30 FXDWG and it adds a little width. I took the bike from Green River, WY to Vernal, Utah, through the very tight twisties and mountains, a good run. The tire never gave any indication of looseness and felt secure. I was having fun touching down my pedals in the tight twisties. With all that, I still have the 'nubs of shame' on the tire, whereas many tires would have shed those early on. An indicator of how well the tire will wear, I think. American Elite is the only tire on recommendation as replacement tires for Harley Davidson, can't beat the quality or ride!!! 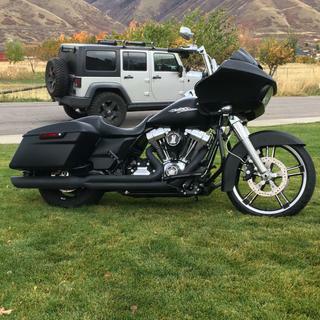 I've been getting my tires here for my 2012 Harley Ultra Limited for several years. Great service, great tire, great pricing. Highly recommend this company! Very good tire wears good!!! Fast shipping!!! Looks good too! I feel good about buying this Made In America product and supporting the vanishing middle class. Great tire, great value. This is my third set. I get around 20k on the back and 22k on the front. First time using these on my harley-davidson. Good tire so far. No complaints. Best Bagger tire available today. I've have installed a significant number of these tires on Harley naggers and have not had one complaint. Everyone tells me they are happy with he mileage and like the handling. I run he American Elite on my Limited and get excellent mileage and handling. I've run this tire since I bought my FLHTK until me tire change previous to this one when I tried a competitor who advertised the same specs and ratings at a lower price. That tire did not measure up performance wise at all. I'm back! This is the 5th set of Elite's I've purchased and the 2nd HD Electric Glide I've put them on. Great mileage and a good ride. Use beads to balance them. Don't listen to those reviews that say they didn't get the mileage. Those people never say if they check the air pressure on a regular basis. Too much pressure can wear them out faster too. I had a bad tire pressure gauge once that read 10# too low. I was running 52 psi. My bike road like I had solid rubber tires when I took all the luggage out of my bags & was riding solo. great price on great front tire! ordered this tire fri. and it was on my doorstep sat. morning. couldn't believe it. thanks!!!!!!!!! I had a vibration above fifty miles an hour. After a wheel balance, I still had a mild vibration. Ordered the new Dunlops and have no more vibration. The wife loves the smooth ride. Great tires! Awsome tires that wear great and ride good too ! 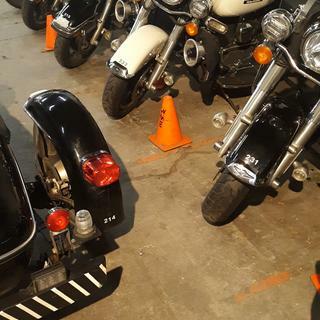 My motorcycle had a bad wobble in the front wheel. This was with the stock D401 tire. I took it in to the dealer and asked them to true it up (spoked rim). Getting the wheel trued helped a little bit but still shook bad at 50+ mph. After buying a new front tire, all the wobble VIRTUALLY went away! It's now perfect with these tires! I love the WIDE lettering on the sidewalls. I actually took a grease pen and marked the "DUNLOP" on the side. Looks really cool when riding down the road--actually. I'm hoping to have more than 12k miles out of these tires before needing to replace them. I will def buy these again over the Michelin Commander IIs simply because these are American made tires. Rocky mtn, has a seamless ordering system, ordered tires on Friday and were at my front door on Saturday. Best price I found on line. Very good tire, this is only the second front tire on the bike (my wife's). It has 38,000 miles on it! I don't think you can beat Dunlop tires for Harley touring bikes. They last and stick to the road in all weather. They do great at 115mph! First time disappointed with the age of a tire I received from JW. Tire date code 4912 - meaning the tire was made first week of Dec, 2012 - tire is already over 2 years old. Ordered rear tire at same time; that date code is 4814 - only 3 months old - more like it. Placed my order Tuesday night and had the tires by 10 am Thursday. Just have to wait for the snow to melt so I can try out my new rubber. Thanks Rocky Mountain for great service. What is the tread depth of this tire new? BEST ANSWER: Tread depth is approximately 5mm. 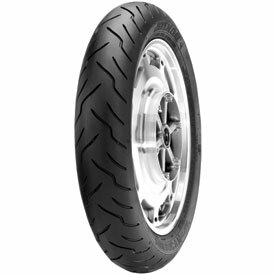 is this a good front tire for a 2014 Harley tri-glide? I have them on my Ultra Classic. I think they are great tires and will use them again when replacing mine. They hold the road well in the rain. I have about 8000 miles on them now and they still have plenty of tread. Yes I have had no issue with the Dunlop tires. I am on my second set as of now. I run it on a 1999 FLSTF and it works great. Is the 110/90 x 19 tire size a match in width and height for my old 3.25 x 19 Dunlop K70? BEST ANSWER: I like my tire, the second set of American elites. I don't know about the sizes I would just ask a local shop before ordering.